Mars is currently an early evening object, now receding into evening twilight. From Cambridge, it will become visible at around 20:18 (EDT) as the dusk sky fades, 30° above your western horizon. It will then sink towards the horizon, setting 3 hours and 46 minutes after the Sun at 23:14. Mars is the fourth planet from the Sun, orbiting at a distance of 1.52 AU once every 687 days. It is our neighbour in the solar system, orbiting just outside the Earth's orbit, and is a small planet – the second smallest in the solar system after Mercury, measuring 53% of an Earth-width in diameter. In the night sky, Mars appears with a distinctly red color, which is apparent even to the unaided eye. This is the result of a high abundance of iron oxide – better known as rust – in its soil. Through a telescope, Mars's surface is a dull red color, though its polar regions often appear to have a markedly whiter hue. Its surface features appear as subtle dark markings on its surface, whose brightness contrasts are often easier to see with the help of color filters. Mars rotates on its axis once every 24.5 hours, meaning that each day on Mars – commonly termed a sol – is only slightly longer than a day on Earth. This has the frustrating consequence that almost the same face of Mars is turned to the Earth at any given time of day on successive days. To observe both sides of Mars within a short period requires either observing at widely separated times of night, or a wait of many days. Mars has two small moons, Phobos and Deimos, which were discovered by Asaph Hall in 1877; they are named after the sons of Mars in Greek mythology. Both are very small – less than 25 km across – and are very challenging objects to observe as they orbit very close to Mars. It is thought unlikely that they formed at the same time as Mars. They are probably in fact asteroids which have been captured into orbit around the planet. Phobos orbits so close to Mars that it feels strong tidal forces which will probably rip it apart within the next 50 million years. More spacecraft have been sent to Mars than to any other planet – as of 2018, 43 in total. This large number can primarily be attributed to Mars' proximity to the Earth, putting it within comparatively easy reach for interplanetary probes, as well the interest of its solid and possibly habitable surface. The success rate of these spacecraft has been very low, however. Of the 43 launched, only 24 have ever returned any useful data. Many of the unsuccessful spacecraft were Russian missions, launched in the late Soviet era. Mars comes to opposition once every 780 days (1.9 years) – its synodic period. Because it lies close to the Earth in the solar system, its distance from the Earth varies dramatically over this 780-day cycle. When the two planets are next to one another in their orbits – the moment when Mars appears at opposition, their separation can be less than 0.4 AU. By contrast, when the two planets are opposite one another in the solar system – the moment when Mars appears at solar conjunction – their separation can exceed 2.6 AU. As a consequence, the size of Mars's disk also changes dramatically: at solar conjunction it is a small and distant speck measuring only 3.5 arcseconds across, while at opposition it measures up to seven times that size. As Mars passes opposition, its distance from the Earth changes most rapidly. As the Earth overtakes it, the two planets are only alongside each other for a couple of weeks. The Earth need only be a few degrees ahead of or behind Mars for the separation of the two planets to be significantly larger than at the moment of opposition. The chart below shows how Mars suddenly glides close to the Earth, before receding back to its usual distance just as quickly. 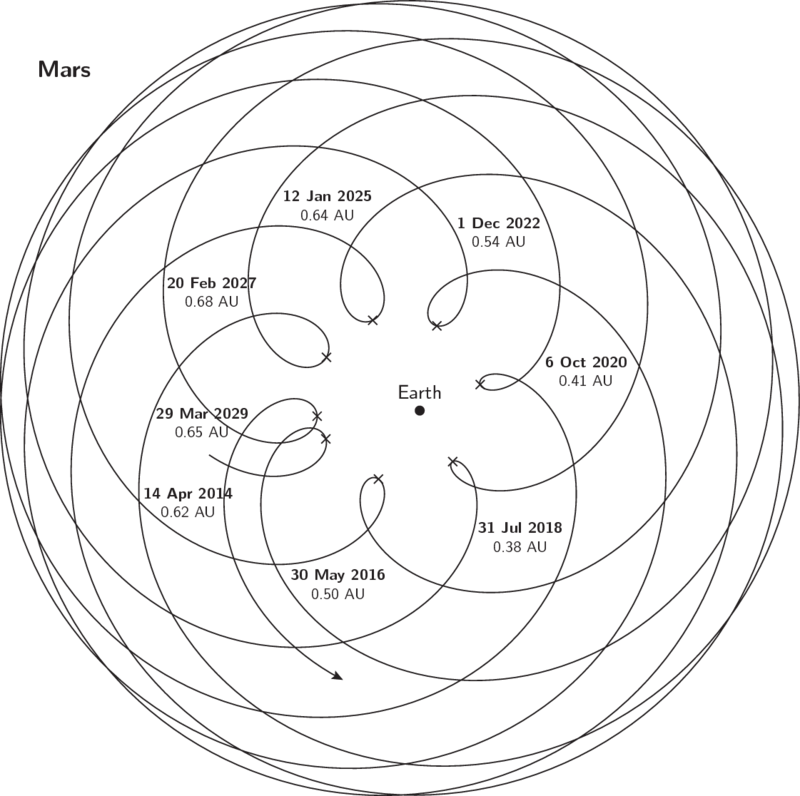 The position of Mars relative to the Earth, at the centre of this chart. The closer Mars is to the Earth, the larger it appears. 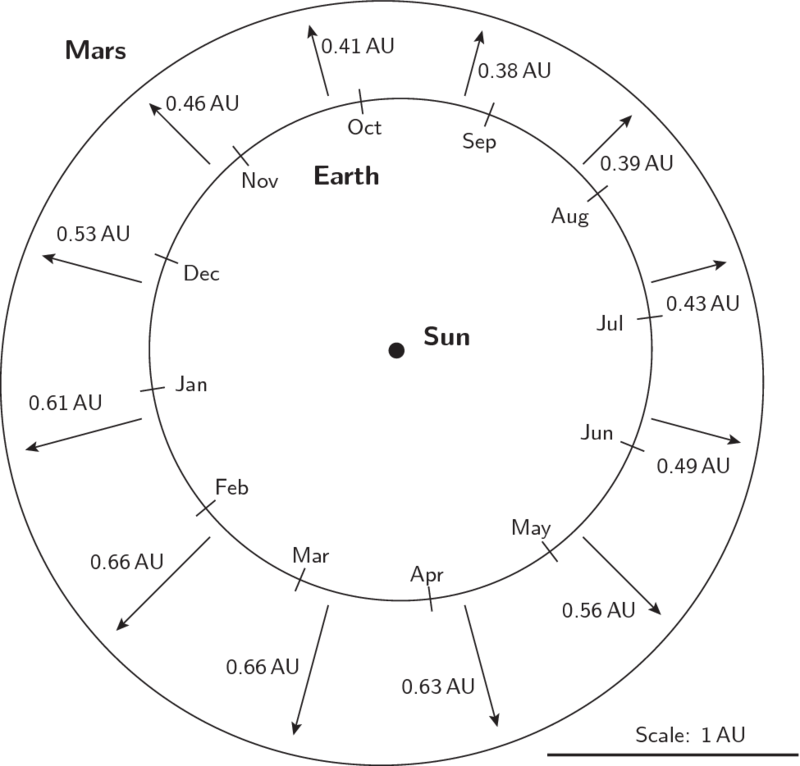 Mars is closest to the Earth when at opposition; the dates of several oppositions are shown, together with Mars's distance from the Earth on each occasion. Mars has the second most elliptical orbit of the solar system's planets. Its distance from the Sun varies between 1.38 and 1.67 AU. As seen from the Earth, the variation in the distance of Mars from the Sun appears exaggerated by the fact that the Earth remains at an almost constant distance from the Sun, not far away. Mars's elliptical orbit gives rise to a much larger relative change in its distance from the Earth than it does in its relative distance from the Sun. This elliptical path means that Mars's closest approaches to the Earth do not always bring it to exactly the same distance from the Earth. When an opposition occurs at any given time of year, Mars – by the definition of an opposition – must lie immediately alongside the part of the Earth's orbit where the Earth is found at that time of year. For example, whenever Mars comes to an opposition in late August, it is always at roughly the same point along its orbit, next to where the Earth lies every year in late August. It so happens that this point is very close to the position where Mars makes its closest approach to the Sun – its perihelion. This also brings it closer to the Earth than is possible at any other time, and it may briefly come within a distance of 0.4 AU of us. The chart below shows the distance of Mars from the Earth when it is at opposition at any given time of year. When Mars comes to opposition in August, we get much closer views of its surface and it appears considerably brighter than when it comes to opposition in February. 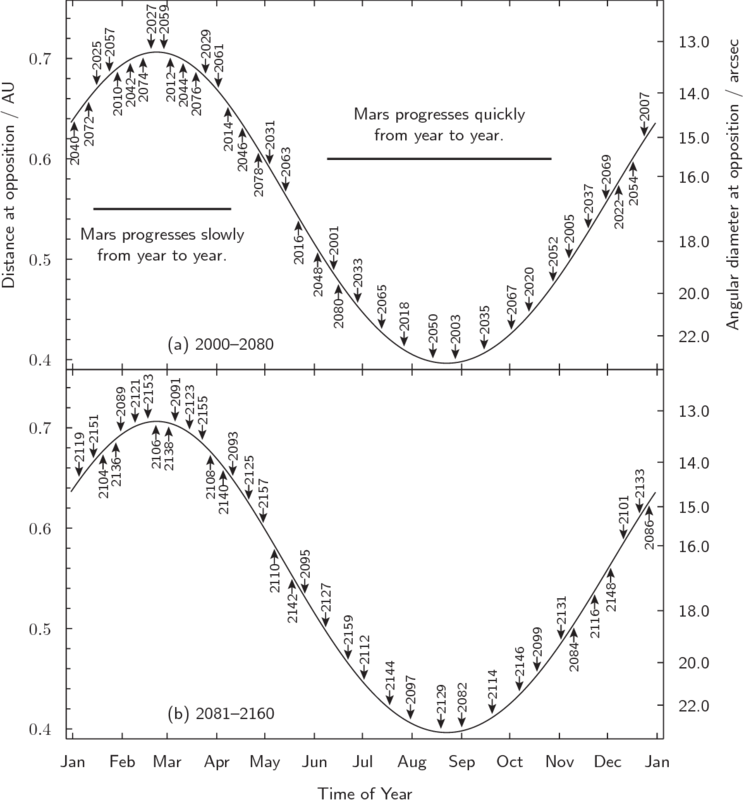 The chart below shows the time of year of all of Mars's oppositions between the years 2000 and 2120, together with the distance and angular size that Mars will have at the time, measured on the vertical axis. A table of the time of day when Mars rises and sets on any given day of the year can be found here. 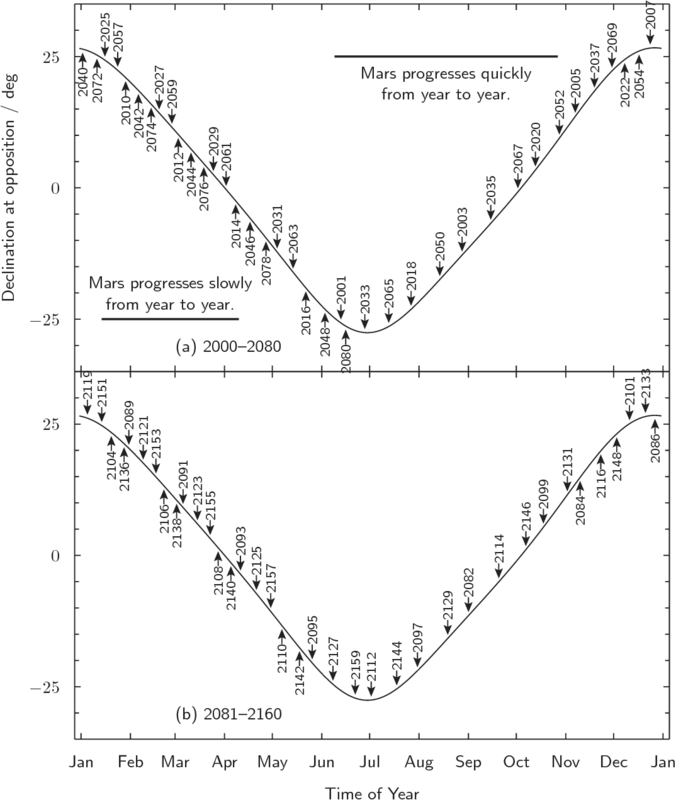 A chart of Mars's path relative to the background stars can be found here.